It’s the osteoarthritis (progressive cartilage destruction) at the base of the thumb: between the Trapezium and the first metacarpal. It’s a common disease among manual workers (including osteopaths!) and women over forty. Then the pain in the thumb occurs while atmospheric pressure changes (the temperature, the humidity). 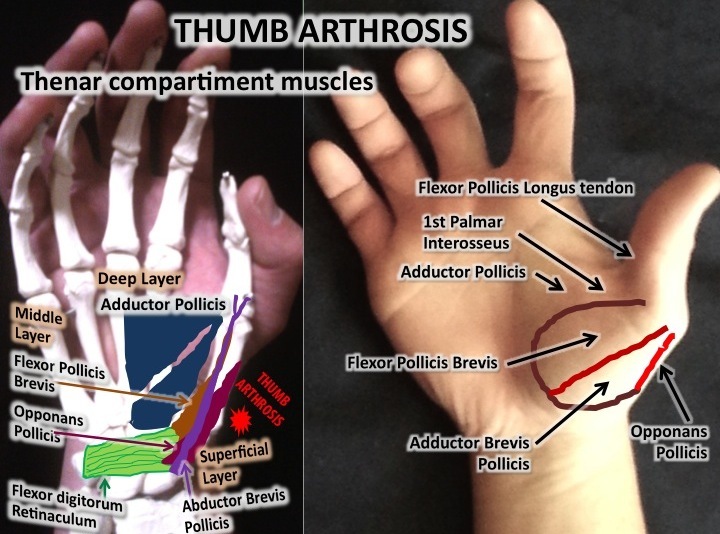 When the joint is inflated by edema, the force of the pollici-digital clamp decreases and the thumb column stiffens. 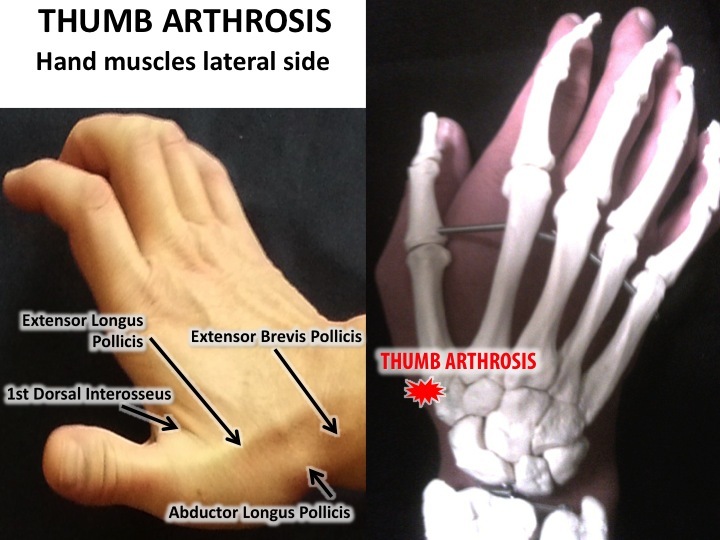 When the cartilage is eroded, the thumb cracks and crunches when mobilized, causing eventually a “Z” deformation or “stair step” appearance caused by the posterior subluxation of the first metacarpal and by the flexion of the interphalangeal thumb. After that, the Thenar muscles become atrophied. The standard treatment is based on rest orthosis, physiotherapy, paracetamol, local or oral (for acute attacks) NSAIDs and slow-acting anti-arthritics. If nightly inflammatory pain shows up: intra-articular injections with corticosteroids and hyaluronic acid are often necessary. Surgery is to be considered in case of failure. The Dynamic Manual Adhesiolysis® for the muscles and the tendons of the thumb column is very effective in mild caused by overuse. But the relapses are inevitable because the patients cannot let their thumb resting indefinitely. Therefore, it is necessary to teach them the manual self-adhesiolysis and even mechanic self-adhesiolysis (because if the other thumb is painful, it is better to use a self-massage device! ).